We need YOU to help us ensure that people living with dementia know they still matter. Join our amazing team of volunteers, in our very unique ‘home from home’ and together we can change lives. If you have a free morning, afternoon or evening we’ve got a place for you here in Saint Joseph’s. Our volunteers enable us to connect emotionally with the people in our care and really ensure they know they are loved and really matter to us. You can make that difference for someone in Saint Joseph’s! Our volunteers come from all walks of life, age groups and life experiences. Every volunteer is important to us. This is a new environment for many. You may never have interacted with someone who has dementia and you may be a little apprehensive. For others, this may be a very familiar experience and it can also evoke very emotional experiences. Whatever experience you may have had in the past, everyone always has a first day here in Saint Joseph’s and our Volunteer Coordinator, staff and families are with you every step of the way. We can honestly say that you will gain more from your experience here by making a difference, meeting new people, having fun and being part of your local community. 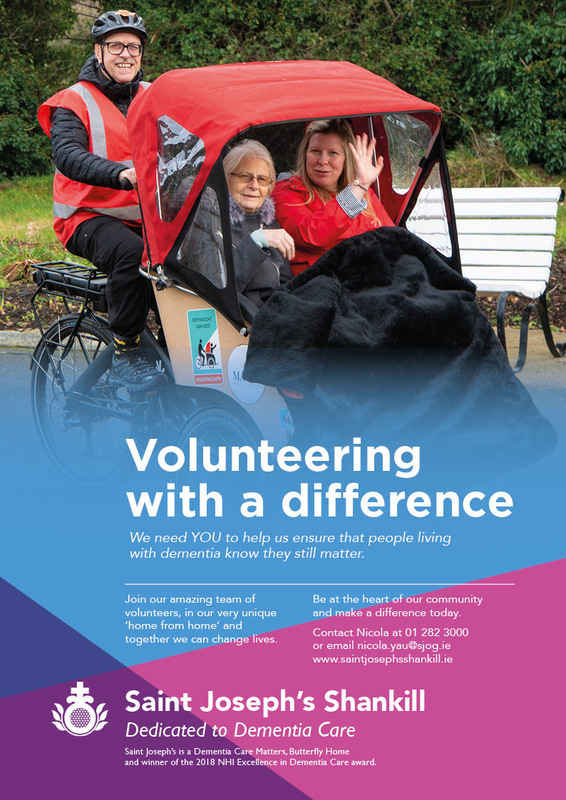 Would you like to volunteer with Saint Joseph’s Shankill, the only care home in Ireland dedicated solely to dementia care? We are looking for volunteers to join our amazing team and make moments matter for the people in our care. Activities brighten people’s day and stimulate memories for people living with dementia. Our Activities Coordinator organises different activities throughout the week. Participation in these activities allows the people in our care to interact in a group, get some exercise, retain hand skills and have a laugh. If you’d like to assist in a Fit for Life class (gentle exercises) or a dance class, then why not volunteer with us today? Administration volunteers use their IT, research and administration skills to assist us with some of the office and programme tasks of Saint Joseph’s Shankill. If you think you could spare some time to help us during the day, we certainly have lots for you to do! Whether you’re a crafter or a knitter, why not bring your creativity to Saint Joseph’s and do some arts and crafts with the people in our care? We’re always looking for creative people to help us decorate Saint Joseph’s for our big events throughout the year: Valentine’s Day, Saint Patrick’s Day, Easter, Halloween and Christmas. Do you like meeting new people and love to have a natter? Or would you like to find someone who has the same hobby as you? If you have an hour or so to spare each week why not volunteer as a ‘Buddy’ Volunteer and visit one of the people in our care on a regular basis. Day Care Volunteers meet and greet the people attending our Day Care as well as assisting with activities throughout the day and engaging with people in a group or one-to-one. Our Day Care is open Mondays to Fridays. We are looking for volunteers who are available on those days from 10am to 1pm or from 12pm to 3pm. If you have one morning or afternoon free every week we’d love to welcome you to the team. It’s nice to get out and about – wouldn’t you agree? Do you have a few hours to spare to accompany the people in our care to events around Dublin and Wicklow? Whether it is a day trip to the beach, grabbing a pint in the local, or even a trip to the zoo, you can come too! Assist the Fundraising Manager with organising and administration of events as well as establishing connections with corporate donors / companies. Volunteers are invaluable for Saint Joseph’s Shankill to ensure our fundraising events run smoothly and all who attend have a great experience. Our fundraising events are a vital part of enabling us to continue our work. Make a real difference in the lives of people with dementia – volunteer with us today! Do you have green fingers? We need you! We have lots of courtyards and green spaces that need some care and attention. If you have a few hours to spare each week then why not volunteer with us? Home is where the heart is. Your role will be to support the people living in one of our six lodges. This can involve chatting with the people living in the lodge, making them a cup of tea or accompanying them to different activities in Saint Joseph’s. Experience with older people living with dementia is preferred, but support and mentoring will be provided. Do you have a few hours to spare each week, then why not volunteer with us today? Calling all DIY experts! If you are a bit of a handy man/woman then why not give a few hours to do some maintenance or a bit of painting? Calling all film buffs! Our movie nights will take place one evening a month for people in our care as well as their families and friends. People living with dementia in the community and their families are also welcome to join us in our cinema. Your role will include setting up the cinema area, meeting, greeting and accompanying people to the cinema area. Lights, Camera, Action – join us for our monthly movie nights! Do you play a musical instrument or are you a singer? Do you have a talent that could entertain small or large groups of people? Perhaps you are a magician or a poet, a juggler or a ventriloquist or maybe you simply enjoy tickling the ivories and singing a few tunes. If you have a talent and would like to share it with the people who live in Saint Joseph’s, why not volunteer with us today? Do you have a winning smile? Are you welcoming and hospitable? If so, being a Reception Volunteer is the perfect role for you – come and be a part of the team of volunteers who welcome visitors and families to Saint Joseph’s every day, outside of office hours (weekday evenings: 5pm – 7pm and weekends: 12pm – 3pm or 3pm – 6pm). Our TrioBike was purchased from funds raised through a number of family and staff run fundraising initiatives. Join the team of volunteers that bring the people in our care out as often as possible so that they can enjoy the wind in their hair and have a chat along the way. Saint Joseph’s is an affiliate of the Cycling without Age international programme which has a vision of creating happiness among our elderly by providing them with an opportunity to remain an active part of society and the local community through local active citizenship. The TrioBike is battery powered and training is provided. What are you waiting for? Get on yer….our….bike! Do you have a car? Are you willing to volunteer for a few hours a week? This role will involve transporting people in our care and their families to and from Saint Joseph’s Shankill for Day Care or social activities. Join us and make a difference in the lives of people living with dementia and their families. We’re ready for the chop! Do you have experience as a hairdresser and have a few hours to spare. Everyone likes to get their hair done and that’s the feeling we’d like the people in our care to have. You could make that happen for them. Our website is okay but we’d like to make it even better! Do you have experience of designing and managing websites? If so, we’d love to hear from you. Why not use your skills and experience and volunteer with us?